It's coming along! Nicely! I don't have to do the work, so looking at the photos it all seems to be progressing well. I like your berm for a little contour in front ---will want to see it planted up with agaves. Oh wow...I feel your pain...and I can't believe you were out in that heat last weekend! I could barely motivate myself to water in the evening! If it makes you feel better, I've tripped, slipped and stumbled over any and everything in the garden...I've even slipped and rolled down both slopes multiple times while digging...not very dignified, I know ;-) Anyway, at least all your efforts are paying off...it looks great! I think the hardscape part is the hardest for us budget-limited gardeners. I love the decomposed granite idea...but, like you, have to save the grander materials for a future time (where I somehow always think I'll have more $$$). I couldn't guess how long the cedar board will last, but we made our borders out of plain-ol' pressure-treated 2x6 boards. I'm not sure how long they will really last (it's been about 3 years so far for the oldest ones). Some day, I'd love a dry-stacked stone wall...but, yikes, talk about expensive! Thanks, scott. It makes me feel better to know that other people take spills in their yards! Thanks, Laurrie! We'll see if I can get the agaves out of the pot without killing myself! 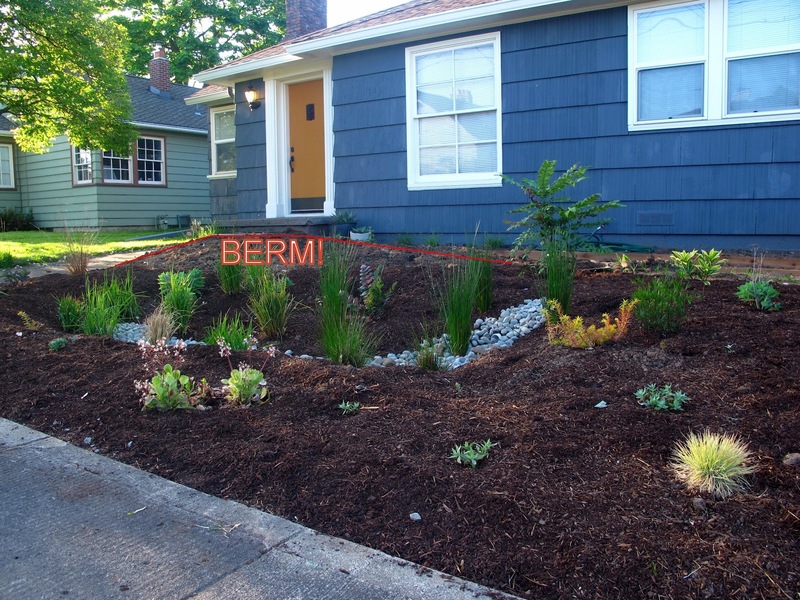 It's pretty clever how your berm mirrors that of your neighbor (at least In the photo). And I hate to sound like a know-it-all (because I don't) but you might want to consider mixing in gravel, pumice, or chicken grit with the soil in the berm to help with the drainage for your Agaves...which by the way I can't wait to see! I edged the lawn/planting beds in our back garden with grey bricks (.69 a piece) as I was doing it I complained many times about how it was a cheap fix for the poured in place edge that I really wanted. Well since then I've grown to love it, mainly because they've aged to the perfect color and if I want to change the footprint of the boarders it's super easy to do. I guess what I'm trying to say is there may be hidden benefits to not getting your first choice right off the bat. Oh and I've committed the classic comedy skit in the garden more than once...after laying the rake down "tines up" where I think it's out of the way I then back up while looking at what I've planted, not where I'm going, and step on it. Causing the handle to come up and whack my backside. Grace. I was actually hoping you'd chime in about soil preparation, so thank you! Do you have a rough estimate of what percentage the grit/gravel/pumice should be in the soil? Any tips you have for siting, prepping or care are greatly appreciated, so feel free to get all know-it-all on me, now or in the future. You're so right about waiting to get what you want in building materials . . . I change my mind so often and I don't have a fully realized plan for the garden yet, so impermanence is good. And I've totally done that rake goof too! I was shocked that that could actually happen in real life. Wow, you've done so much work! Can't wait to see the paths when they're done. Gardeners should never need to go to the gym. Look what you got in return for all that labor. Impressive! Hey there! Just wanted to say thanks for all the native lovelies--they are mostly settling in well and have vastly improved my yard! I think the currant resented being moved, but she'll come around eventually I hope. Well if you need any of your agaves back, so just let me know! I felt bad taking all of them like that. No, no, no--don't want any back! I'm super glad you took them all.